Every December, My family looks forward to celebrating the New Year. We don’t throw a fancy party and we don’t go out for a night on the town. Instead, our New Years Eve is spent at home with our four kids. It is low key, and so much fun! We wear our PJ’s, make crafts, eat yummy treats, and when the clock strikes twelve (or 9pm on the West Coast) we make some noise and pop some confetti. I’ll be honest, now that we are living on the East Coast, it’s going to be a little difficult to stay up to count down! If you haven’t heard of celebrating the “east coast countdown” with the kids on the west coast, you’re missing out! At 9pm the younger kids would countdown in real time with the East Coast, celebrate, and be in bed by 10pm – it was win win for everyone! 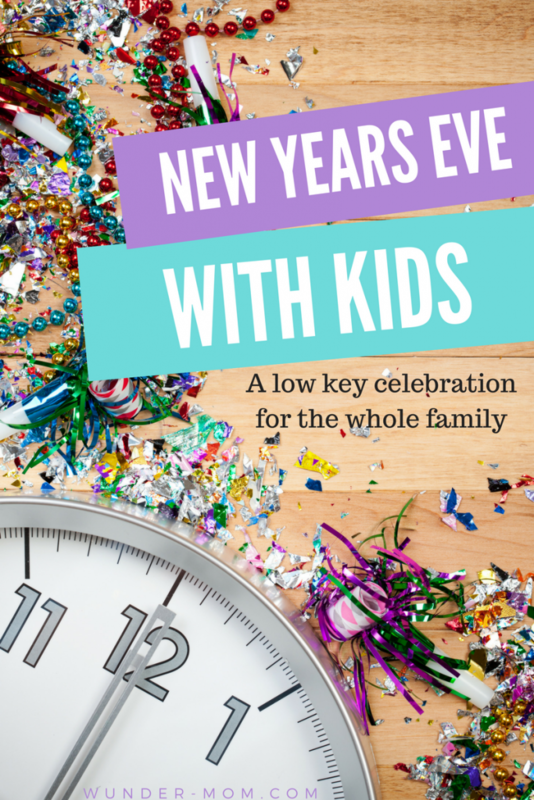 We have some favorite New Years Eve crafts and activities that I want to share with you so that you can put on a super fun New Years Eve with kids! I am all about the snacks and appetizers when having low-key family fun nights. It’s easy to prep and the kids can eat as they please. We always serve kid drinks in plastic champagne flutes and eat countdown cookies for our dessert. It’s hard to wait up all night for the ball to drop so we like to pass the time with fun games! We love to play New Year’s Eve Bingo and have a balloon stomp competition. Even the little ones can participate in the games with some celebration playdough! Print and color your own New Years Eve Part Hats and decorate your own noisemakers made from water bottles. We make our own confetti to put in our Balloon Poppers and decorate a Time Capsule add our memories too. Opening the time capsule the following year is such a treat! You can have your family fill out their new years resolutions, and decorate a wishing tree to hang them on!